The Orphanage Volunteer Project is only available for the first two weeks of each month. Volunteers are welcomed to stay after those two weeks and participate in another project – mixing and matching between the various volunteer projects and internships in Thailand is encouraged. Waking up with a fish pond and rice paddies outside your window, mountains in the distance and more than 50 children waiting for your attention – this is what volunteering in Thailand is all about. Volunteers in this project stay on the project site five days a week, enjoying well-earned rest and relaxation over the weekend in Chiang Mai city. There are also plenty of nearby attractions and events throughout the year. It’s not possible to say exactly what you’ll be doing from day to day. Many of the tasks volunteers are asked to do depend on the season, the week’s weather, which maintenance projects or repairs need to be carried out and the number of volunteers currently on hand. Morning and afternoon activities include gardening, painting, cooking, fixing broken toys, teaching an hour or two of English at the local school, shopping at the local market for dinner or just preparing activities for the children to enjoy when they return from school. A strong dose of flexibility will ensure that you’re ready for whatever this orphanage or the kids throw at you. When the kids start making their way back home after school, volunteers help with homework, cooking and cleaning. 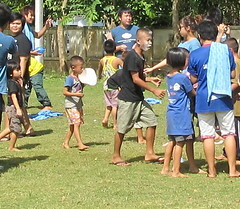 They also spend time with the children and engage them in fun games and activities, such as soccer, painting or music. As these children are orphans, our volunteers also invest in their lives simply by spending time with them and by providing the care and love that all children need. Volunteers at the orphanage project enjoy occasional down time as well. This is a perfect opportunity to get to know your fellow volunteers over a cup of coffee. 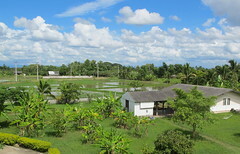 While you’re at it, you can take in the beauty of northern Thailand’s countryside from a patio overlooking a quiet fish pond and the surrounding rice fields. 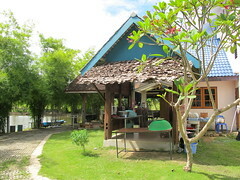 Life moves slowly in rural Thailand, so you’ll have plenty of time to relax. Being an orphan in any country is never an ideal upbringing. Roughly one-fourth of the children at this orphanage are HIV positive, which provides yet another huge obstacle for them. The dedicated staff looks after these kids, but as with any orphanage, extra care and love from adults is always needed. Individual attention from adults (such as sharing a storybook or helping with homework) provides vital support to these kids in their development. It is easy to think, “I’m just a foreigner. What can I do to really make a difference for these kids?” The two co-founders and directors of this orphanage are also foreigners in Thailand. With a lot of work and love, they have taken in hundreds of children over the years – children who otherwise would not have had much of an opportunity. In the process, they’ve given them the chance to go to school, eat good and nutritious meals and receive support and care from hardworking volunteers like you. 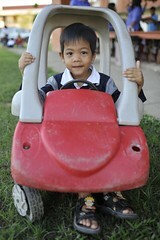 __Participation in the Orphanage Volunteer Project is $999 for the first two weeks of each month (only). Airport pick up, accommodation during orientation and entire project time, breakfast every morning, lunch and dinner every work day, 2 day orientation (including half day city tour, cultural dinner and show), onsite coordinator, transportation to and from orphanage and Chiang Mai (for weekends off), 24 hour emergency assistance and written record of service completion. Plane tickets, travel insurance, cost of criminal police background check required for this project, ride to the airport after service, lunch and dinner (on weekends).